"I wanted something to read." states S.E. Hinton. "I'd wanted to read books that showed teenagers outside of the life of, 'Mary Jane went to the prom.'. She recalls, 'The books available just didn't read true, they didn't deal with the real lives of teenagers." *She began writing The Outsiders during her sophmore year at Will Rogers High School in Tulsa, Oklahoma. Even though The Outsiders was her first published novel, it was actually her third novel. She had written two previously- neither of which were published - all before the tenth grade. She had been writing since the third grade, and her stories had almost completely been about cowboys and horses, including her first two unpublished novels. 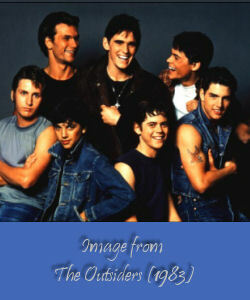 **It took Hinton only a year and a half to write The Outsiders (the same year she managed to earn a grade of 'D' in a Creative Writing class). "The whole status thing drove me nuts," she says of her high school years. "It drove me nuts that people would get worked up over who they should and should not talk to in the hall." She got the call that the book had been accepted for publication the day she graduated from high school. The book was released by Viking in April of 1967, as she was in her freshman year at the University of Tulsa. It is well known why the initials of S.E. Hinton were chosen by her publishers at the time the book was initally published. However Ms. Hinton continues to utilize the name for publishing as it gives her the anonymity she loves at home and in her private life. She is a very private person and using the initals help protect that. The following list is paperback-only and figures are through the end of 2000.